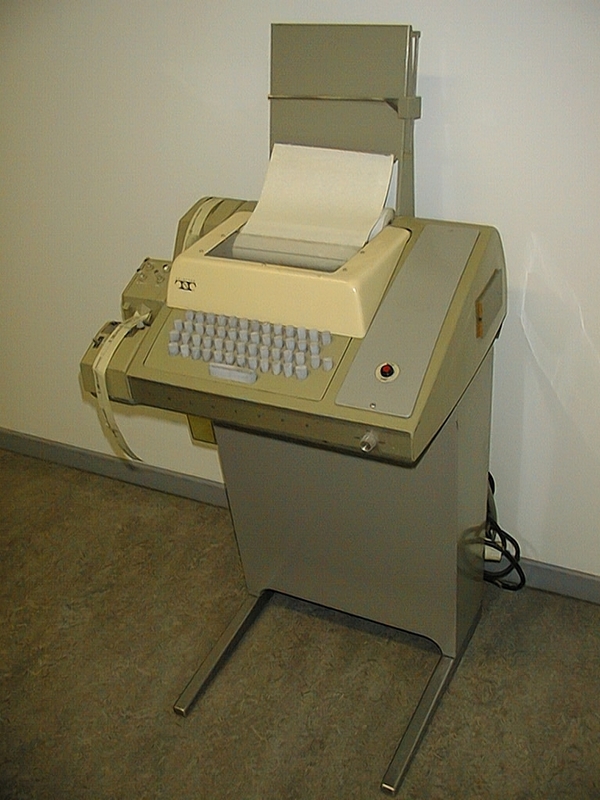 The Teletype was used as the console of the first computer of the department. This device is largely mechanical driven by a motor and steered by relays. The Teletype was coupled to the Varian by a 60 milliampere current loop, it operated on 110 baud. serial lines are often called /dev/ttyxx. (the tty refers to TeleTYpe). The same root can be found in the pseudo tty's used in networking. the 110 baud speed largely explains why the original Unix commands are so terse. originally the Unix erase character was # which makes sense on a printing terminal. Ebay recently (dec/2/2003) offered a teletype for sale, do not forget to read about Bill Gates early use of teletypes.